Needless to say, MusicRadar didn't exist in 1992. In fact, the internet as we know it didn't even exist in '92. Nor did modern DAWs, software synths, VSTs… You get the picture. So the fact that drum 'n' bass legend Andy C was producing electronic music back then is impressive enough. What's astounding, though, is that now, 18 years later, he's still at the top of his game. 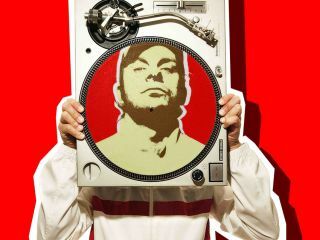 These days he's renowned as one of drum 'n' bass's most respected DJs, founder of Ram records and a producer in his own right. Back in '92, as drum 'n' bass was first blossoming as an offshoot of jungle, Andy founded Ram with co-producers Ant Miles and Shimmon as an outlet to release his debut Sour Mash EP. As Ram Trilogy the trio released a string of influential tunes through the '90s and through their label cultivated a crop of producers at the heart of drum 'n' bass. Throughout that time Andy C has been heralded as one of drum 'n' bass's finest DJs, pioneering 3-deck quick-mixing techniques and releasing numerous mixtapes that helped define the genre. His new mix CD, Nightlight 5, is released this week; showing off a wealth of new, unreleased music from the Ram family as well as, of course, Andy's own mixing prowess. How has the rise of digital gear and computer music technology changed the way you work as a DJ? Do you still prefer to stick with a classic turntables/mixer setup or do you now include more hi-tech gear in your setup? "I still play vinyl and dubplate on three decks and an Allen & Heath Xone: 92 mixer. Personally I prefer DJing this way as I like the physical interaction between myself and the music. I feel, visually, it lets the crowd see how hard I'm working as well! "I feel like I'm one of the last people DJing like this and it's a real pain at some shows, as most of the sound techs these days don't account for jumping needles and feedback, so it can be a battle." Do you think that technology has made it easier for people to DJ these days and, if so, do you think this is a good or bad thing? "It definitely has! But is that a bad thing? A lot of people had a problem initially with CDJs and then Serato/Traktor, saying that it was cheating or taking the skill out of it. But I feel that whatever setup you are using, as long as it helps make your show better then why not? "What I'm not that into is the staring at screens that goes with it, as I feel you loose a certain connection with the crowd. I like to see DJs push themselves and the equipment, and as long as the dancefloor is moving then it's all good." When you first started making music what were the first bits of gear you owned/used? "An Atari ST running Steinberg Pro 24 and an Akai S950 sampler… those were the days! "My first release on Ram took six months to make as the S950 was monophonic, so I had to lay it down onto multitrack tape. A simple three-note chord would take up three tracks as I had to record each note separately! Thank god they updated it to the polyphonic S1000!" When you spoke to our sister magazine Computer Music back in 2005 you said that, on the whole, you didn't really have any particular preference for a DAW. Has this changed at all? Do you think there's any particular program that's become essential for drum 'n' bass producers? "I'm not sure…. the more time goes on, the more you realise that a certain program or plug-in is not going to make you a killer tune. It's about the sounds and ideas you put into it. I see people caught up in getting the latest and greatest software instead of actually making music. It can become an obsession! "I can speak from experience as a producer and also A&R'ing the guys on the label that all the most popular tunes are made quickly using the best quality sounds and ideas. The tunes that take the longest often get forgotten the quickest!" Can you tell us a bit more about your studio/production setup these days? What gear is at the heart of it? Do you still prefer to use hardware or are you a fully-fledged digital convert? "I guess I'm fully into the digital side of things when it comes to studio production. The music that I hear the artists on Ram producing is all made in the box and it sounds amazing!" Overall, do you think the rise of computer music and digital technology has had a positive or negative effect on the world of drum 'n' bass and rave culture as a whole? "Positive, for sure. Don't get me wrong, for a while some of the organic, human feel was lost, especially on the bass and breaks side of things, but as time has gone on producers have got that back and then some. The quality of some of the music is astounding, sonically and technically." Over the years have you been forced to adapt or change the way you work, in terms of gear and technology, in order to stay at the top of your game for so long? "As I've said before the change to digital was a big one for all of us that were producing in the early '90s, but it's something that had to be embraced. Time moves on, things get better and you have to go with it. At heart I've always been massively into computers so I've enjoyed the whole process." Are there any particular bits of kit that you now can't live without? "My Macs are my essential bits of kit, and my laptop goes everywhere with me." How has the internet changed the way you run a record label since forming Ram back in the early '90s? Is it easier to spot promising new producers or does it make it harder for people to get their stuff out there? "The internet has been huge for us and for all music. Most of the new signings were done because of demos that I was sent over through AIM." "It's been great to connect with artists, and also to throw ideas back and forth. As well as that it has opened up my record box to so many artists from all over the world and that never would have happened a while ago." Can you tell us a bit about what you've got going on with the Ram Records collective at the moment? Are there any particular artists you're very excited about working with? "The last two years have a fantastic for us with the Chase & Status and Sub Focus albums. "I'm just about to release my new mix CD Nightlife 5, which has over 60 tunes on it! There's so much good DnB out there at the moment and it has given me a chance to showcase material from the new signings at Ram as well as representing all sides of drum 'n' bass. We have a number of projects on the go, so 2011 is going to be busy for sure!" Andy C's Nightlife 5 compilation is out now via Ram Records.